Sadie now thinks that at 4am she should leave her bed and join us on ours. She remains snuggled up to one of us until about 5:30am when she and I both must relieve ourselves. Then she races back to bed until 6am when she must have her breakfast which is Nature’s Domain with her daily dose of yogurt and vitamins. 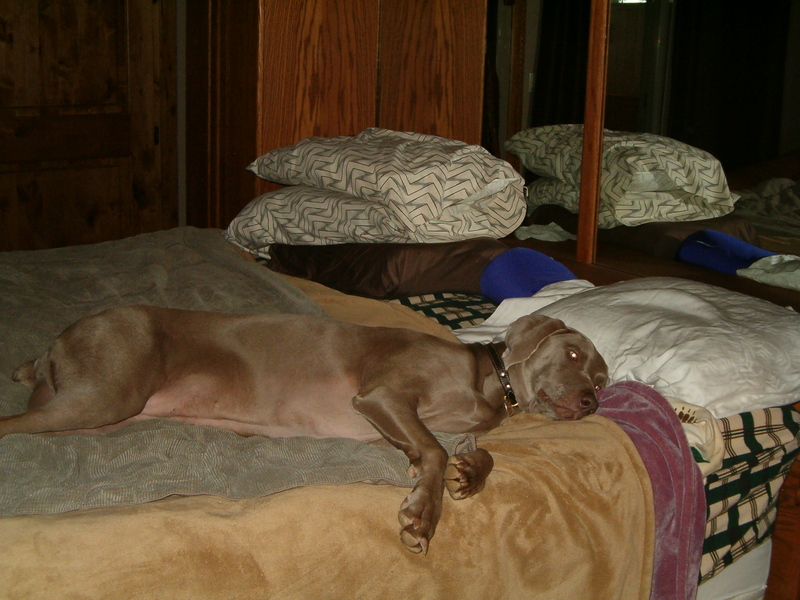 Then it’s back to one of her many beds. Sadie is a Bit Spoiled. 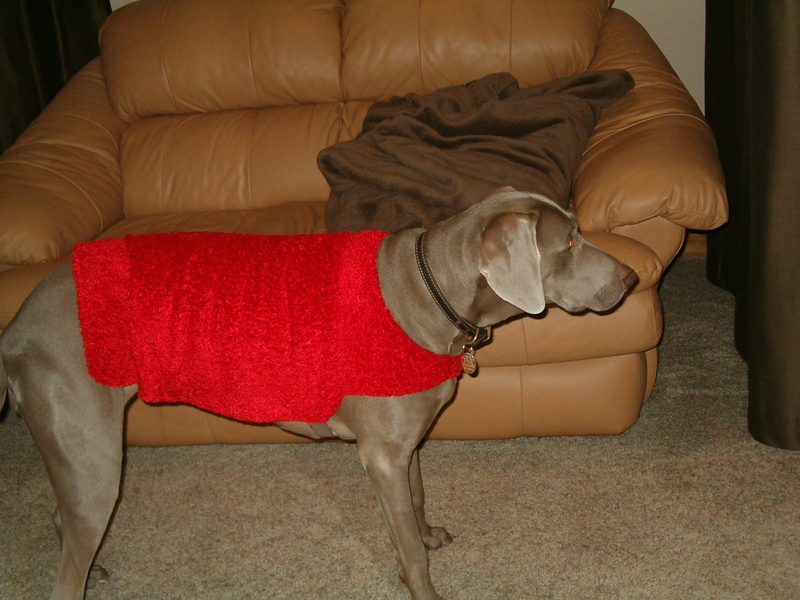 Here is the special red fleece Sandy made for her so she will stay warm outside in the winter. She really doesn’t need it, she loves the snow. Cliff taught her to love the water, now anytime we are near a puddle she must get in it. 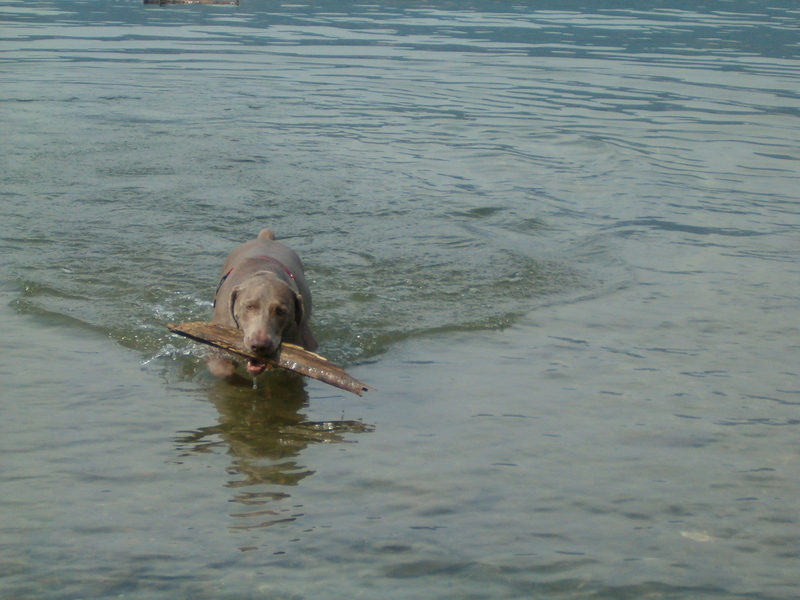 The ponds on the golf course are her latest love, she chases the fish or dives for a stick on the bottom. 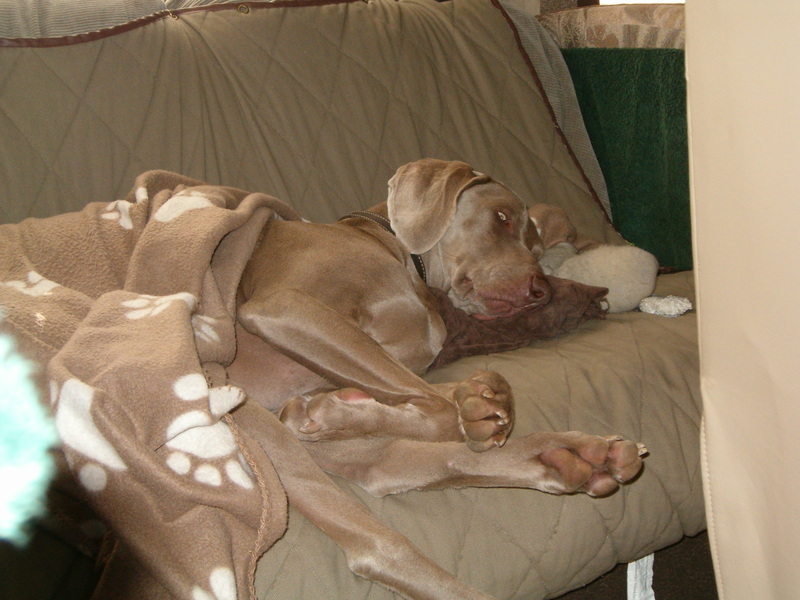 In the RV she loved being covered with a blanket on HER couch. Sadie is now 90 pounds. She is not fat. The measurement at her shoulders is 29 inches, she is very long as well. She has caught gophers, squirrels and quail this summer. She wants desperately to chase the deer but I won’t let her. We still get compliments on such a beautiful animal every time we go out. She is very good with people now unless they come to the door and ring the door bell. She raises quite a racket then. 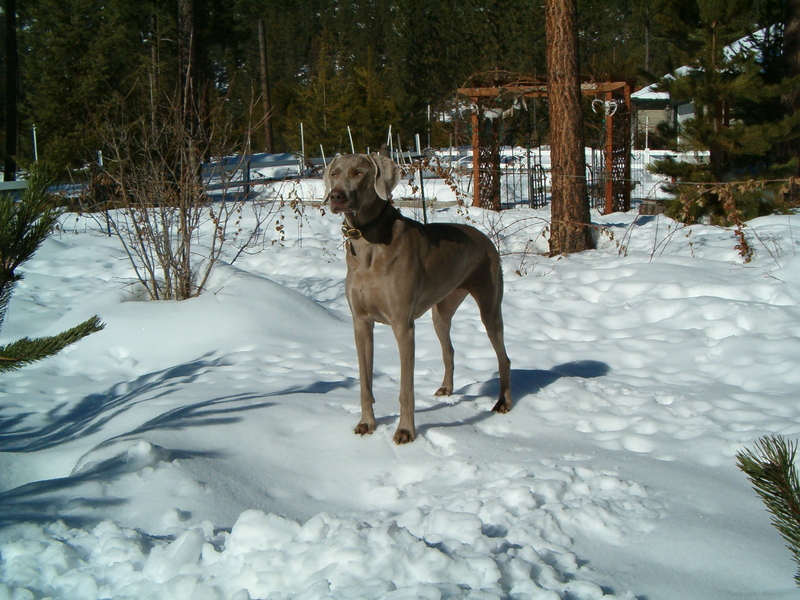 She is a fantastic watch dog, something that I think a lot of people overlook with their weims. We leave next week for our place in Mesquite, Nevada. She hasn’t been there since she was 6 months old so it will be interesting to see if she remembers the place and area. It’s been a rough year, Sandy has had breast cancer for the last 9 months. We are just about done with all her treatments, chemo, radiation, two surgeries and finally she was pronounced cancer FREE!! Two more treatments of Herceptin and she is done. Enjoy all your blogs except those long haired mongrels. I really don’t like them at all. 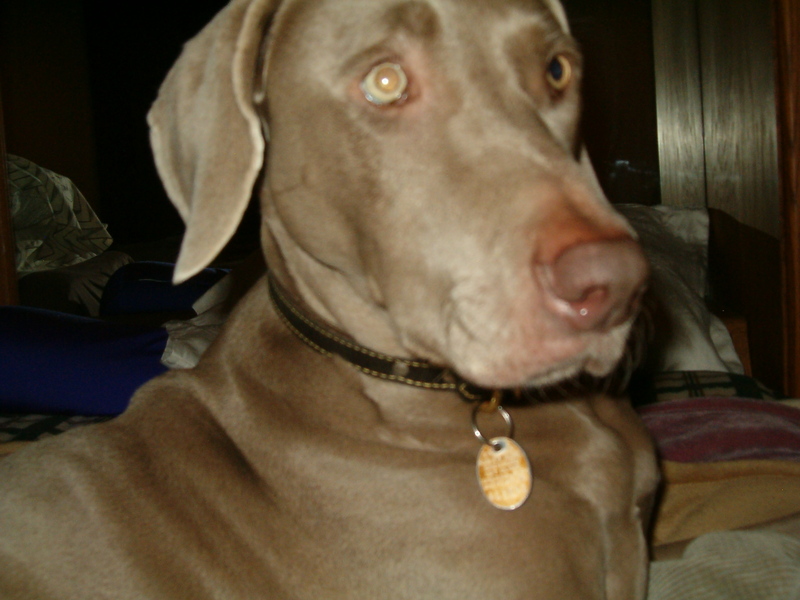 Weims to me look like Sadie and nothing else. Sorry.